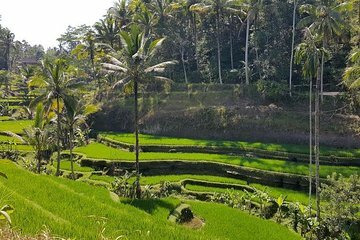 Com apenas um dia para apreciar os destaques de Ubud, esta excursão de dia inteiro privada garante que você não perca nada. Visite as vilas de artesanato de Celuk e Batuan; navegue pelo Ubud Art Market; e visite os pontos turísticos, incluindo o Tegallalang Rice Terraces, o Royal Palace, a Monkey Forest e a Tegenungan Waterfall. It was just what we wanted. A very good driver, very good English, Excellent knowledge of Bali and showed us what we wanted to see. This was our tour for our first day in Bali. What a perfect way to start our trip!! It was nice to be on our own schedule and skip things or stay longer at the monkey forest. Really great value! This was an amazing tour. Our guide Wayan spoke excellent English and our driver just as good. We interacts and communicated well which was great as we learnt a lot about the culture of Bali, the history and anything g we asked both were only too happy to answer. Fantastic! This was a great tour. Putu, my guide, knew a lot about Ubud and Bali in general. He had a great passion to share his knowledge about his culture and took me to the main places you want to see when in Bali. If you are looking for a first introduction to Bali, I think this tour is a great place to start. My tour guide, Wayan Dui, was the best tour guide we had visiting Bali. Very knowledgeable and spoke english very well. Highly recommend. I was excited but was disappointed by the end. This tour is spent mostly in the car driving around as there is a lot to see and a lot of traffic all the time and you don't get the proper time to actually enjoy the sites. We actually drove through Ubud and didn't get out to explore it at all. I was quite quick getting in and out of sites and I still did not get to see the Royal Palace because I was told we don't have any more time. I was taken to woodworking and silver factory instead to purchase things of course. I didn't like it but one tries to be polite. It was just me and my driver/guide. Sweet guy but it was a driver and not a guide. I don't like how Viator tells you what an amazing guide you are going to get and some of them barely speak any english and mostly don't know the answer to any of my questions. It would be cheaper to hire a driver for the day. I would not do this again! Our guide Putu was amazing, on time and took us to all the sites we wanted and extra stop at coffee plantation. He even took us to nice restaurant on way back to hotel and waited for us. The trip ticks all boxes in 1 day. One of the best ways to see Bali. This is a great tour, we had two amazing tour guides as there was 7 of us in our group and they looked after us so well and were very knowledgeable. This is a long day - 10hrs, we opted to not do some of the stops as we really only wanted to see the monkeys, rice terrace and waterfall. The stop for lunch was an amazing location!